The Mapmaker’s Children has been good company on my daily drive to my father’s aged care residence, and I was sorry to come to the end of it. Structured in two alternating time frames, the narrative tells the story of Sarah Brown, the daughter of legendary abolitionist John Brown who worked on the Underground Railroad used by slaves fleeing to the north. Sarah reluctantly chooses to forego marriage because she can’t have children and instead forges an activist role for herself, covertly making maps for illiterate slaves to follow a network of safe houses to eventual freedom. Over 150 years later, Eden Anderson struggles to bring meaning to her life when infertility derails her assumptions about what her life will be. But when she finds an old porcelain doll in the cellar of the house she has moved to, she discovers a past of secret messages that links the history of her house with the Underground Railroad. Apparently imagined from the real life story of Sarah Brown, the historical narrative presents an idealised picture of an heroic woman. Even when her father is hanged for his part in a rebellion, Sarah remains determined to contribute to his work. She makes herself known to Frederick Hill, another activist for the UGRR, and through an increasingly affectionate correspondence about their shared work, they fall in love. But in an act of true altruism, she declines his proposal, without telling him that the reason is that she can’t give him the family he expects to have. The Civil War intervenes bringing further heartbreak for all concerned, but her courage and determination never falters. There is little to suggest that she felt regret about her decision, even when Freddie continues to write loving (and, IMO, indiscreet) letters after his marriage elsewhere. 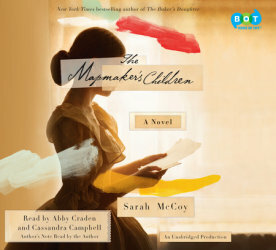 The Mapmaker’s Children is commercial fiction but McCoy writes with great empathy about how infertility can blight a life. For Eden, the issue is complicated by 21st century fertility technologies which promise much but deliver a very low success rate. Hormone therapies play havoc with her emotions, and her self-pity and mood swings threaten a marriage made vulnerable by her husband’s work away from home. In a small community it seems that everywhere she goes there are daily reminders of her ‘failure’; and there are two instances of the unfairness of easy motherhood for women who don’t value it. But a small community also offers the opportunity for engagement and eventually, a sense of purpose and a gradual healing. The nature of the audio book experience means that reviews have to be brief. I can’t quote from the book, and it’s not possible to flip through the pages to check the name of a character or a plot point. What I can say is that the historical narrative is more compelling because of the risks, dangers and inevitable tragedies, while the contemporary narrative seems more authentic in its portrayal of a less admirable, but more realistic character. The irony seems to be that the increased opportunities available to women in the 21st century don’t necessarily offer a sense of purpose to compensate for infertility, whereas in the 19th century having an heroic cause to support could, in some circumstances make a life worthwhile. I am not sure if either of these propositions is true, but from this novel I enjoyed learning about the Underground Railway and the ingenious ways in which communication was managed. We don’t discuss enough the poor quality of some audio books, I need – and mostly get – high quality diction to break through the constant rumble of my truck engine. As it happens I have also just finished a fictionalised account of the underground railroad, and I’m torn. These stories need to be known, but are we over emphasising the role of white people to make ourselves feel better about slavery and all the other forms of oppression of non-whites. Yes, it’s a dilemma, I agree, and it’s probably a bigger one in the US. I dislike Courtenay as you know, and it was his famous Power of One that triggered my dislike. The One, of course, was White. BTW if there are any authors out there reading this, you know how I’m always banging on about wanting books that have a powerful theme, I want a book about the brave underground network that sheltered the draft resisters during the Vietnam War. I’ve never read anything about this in a history and I know why, it’s because even now those people’s names are not ever mentioned. It would have to be written as a novel, and it would resonate now because we suspect that there are people sheltering refugees in the same way.